Jennifer Ramsey is “born and raised in Central Square, Cambridge”, as she puts it – as were her parents and her grandparents. Now, her son is the 4th generation of her family to be brought up and attend school in this part of Cambridge – the same elementary school Jennifer attended! Jennifer and her son live in the Bishop Allen Apartments, which Just-A-Start purchased to prevent the units from being converted from affordable to market rate rents. These units were a recent preservation and rehabilitation project for Just-A-Start, and the buildings were renovated in a way that enhances the original architecture from the 1880s. 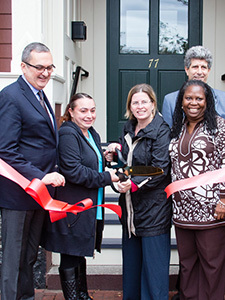 In fact, Just-A-Start was recently awarded the prestigious Cambridge Historical Commission Preservation Award, with Curtis Construction, for the preservation and rehab of the Bishop Allen Apartments. But to Jennifer, the renovations of the apartments had a much deeper and more personal impact. While the construction was underway, Jennifer was diagnosed with multiple sclerosis (MS), and it quickly became clear that she needed an apartment that was configured to be completely handicapped accessible. The Just-A-Start staff and contractors made that happen, by working closely with Jennifer and her doctor to make sure her apartment had everything she needed to manage her disease. For Jennifer and her family now: “It’s a really beautiful apartment – it just couldn’t be any better for me and for my family! Now I can raise my family in this safe community – we love Central Square! This means everything – the world – to me”.